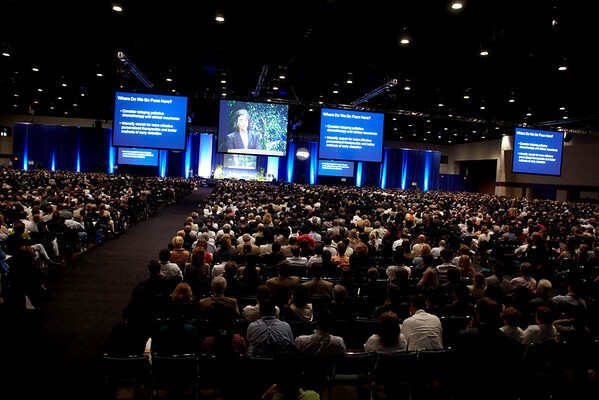 Orlando, FL - ASCO 2009 Annual Meeting: Plenary Session crowds at the American Society for Clinical Oncology Annual Meeting here today, Sunday May 31, 2009. Over 25,000 physicians, researchers and healthcare professionals from over 80 countries are attending the meeting which is being held at the Orange County Convention center and features the latest cancer research in the areas of basic and clinical science. Date: Sunday May 31, 2009 Photo by © ASCO/Todd Buchanan 2009 Technical Questions: todd@toddbuchanan.com; Phone: 612-226-5154.